God is in his sanctuary in heaven and is a solid place his people can take comfort in.”This shall be written for the generation to come: and the people which shall be created shall praise the Lord. For he hath looked down from the height of his sanctuary ; from heaven did the Lord behold the earth; To hear the groaning of the prisoner; to loose those that are appointed to death”. (Psalm 102:18-20). At times it may look as though our enemy has full run of a situation, but it is at this time we need to remember the patience of the Lord and that he will move on our behalf…..For we understand his way when we enter his sanctuary! “When I thought to know this, it was too painful for me; Until I went into the sanctuary of God; then understood I their end. Surely thou didst set them in slippery places: thou castedst them down into destruction. How are they brought into desolation, as in a moment! They are utterly consumed with terrors. But it is good for me to draw near to God: I have put my trust in the Lord God, that I may declare all thy works”. (Psalm 73:16-19,28). It is by the testimony of the people of God that his light shines in the earth. It is written he is our sanctuary, but for those who do not know his way he is as a stone of stumbling and they will stumble and fall. Anyone who does not speak according to his word do not have any light in them. Sanctify the Lord of hosts himself; and let him be your fear, and let him be your dread. And he shall be for a sanctuary; but for a stone of stumbling and for a rock of offence to both the houses of Israel, for a gin and a snare to the inhabitants of Jerusalem. And many among them shall stumble, and fall, and be broken, and be snared, and be taken. Bind up the testimony, seal the law among my disciples. To the law and to the testimony ; if they speak not according to this word, it is because there is no light in them”. (Isaiah 8:13-16,20). The sanctuary of God is ever before his people as they keep the covenant of old and the heathen (unbeliever’s) will see that God is in the midst of you! 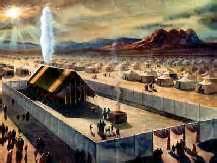 “My tabernacle also shall be with them; yea, I will be their God, and they shall be my people. And the heathen shall know that I the Lord do sanctify Israel, when my sanctuary shall be in the midst of them for evermore”. (Ezekiel 37:27,28).